In July, I was part of CUPE’s first international solidarity delegation to Israel-Palestine. Our goals were to learn about the situation facing workers, to understand the impact of Israel’s military occupation on Palestinians, and to hear how the Palestinian people have resisted repression and maintained the struggle for their land and self-determination for over 70 years. We traveled throughout Israel-Palestine, to large cities and many smaller communities including Khan al-Ahmar, a Bedouin community in the West Bank facing demolition. We met with activists and leaders in the labour movement, legal advocates, civil society and human rights activists, academics, Canadian government officials, and representatives of the Boycott, Divestment, Sanctions (BDS) movement. With few exceptions, the message was clear and unequivocal. The Palestinian people live under a regime intent on displacing them from their land as the original indigenous inhabitants of the region. A sophisticated system of segregation and discrimination is used to achieve this goal, denying Palestinians their most basic human rights including their right to self-determination. The best-known feature of the occupation is the over 700-kilometer-long wall built by Israel in the occupied territories. Constructed on the pretext of enhancing security, the wall is a tool of intimidation, separation and annexation. In Gaza, nearly two million Palestinians are living under a blockade and prevented from leaving. The day-to-day reality for people in the Occupied Palestinian Territories includes restrictions on movement, arbitrary arrest and detention, confiscation and destruction of property, segregation of transport, denial of basic services and resources and disproportionate military response to even the mildest forms of protest and resistance. Palestinian citizens of Israel have also suffered a severe erosion of their civil rights. In late July, the Israeli Knesset, or parliament, approved the Jewish nation-state Basic Law. This legislation removes the official language status of Arabic, legalizes housing discrimination based on ethnic, religious, or national background and denies Palestinians the right to self-determination. Workers in Israel are struggling in an economy shaped by reforms that led to the privatization of the public sector and the transfer of state assets to a few wealthy families. The social and economic system that has developed over the last two decades is fuelling enormous income inequality. Israel has a high rate of inequality according to the Organization for Economic Cooperation and Development (OECD). More than a million workers live below the poverty line. Young workers, migrants and Arab workers are particularly vulnerable to the weakened social safety net and inadequate recognition of labour rights that coincided with these reforms. Workers in the occupied territories are extremely vulnerable under these conditions. They share the same experiences of precarity felt by workers around the world, but the occupation makes their work experience doubly precarious. Many are forced to work in the illegal settlements or in Israel, where protection of rights is limited. A permit is required to work outside the boundaries of the occupation. Revocation of this permit is used to threaten workers who resist in the workplace, but also in their communities where a tremendous amount of violence and intimidation takes place. Women are particularly at risk of harassment and exploitation. 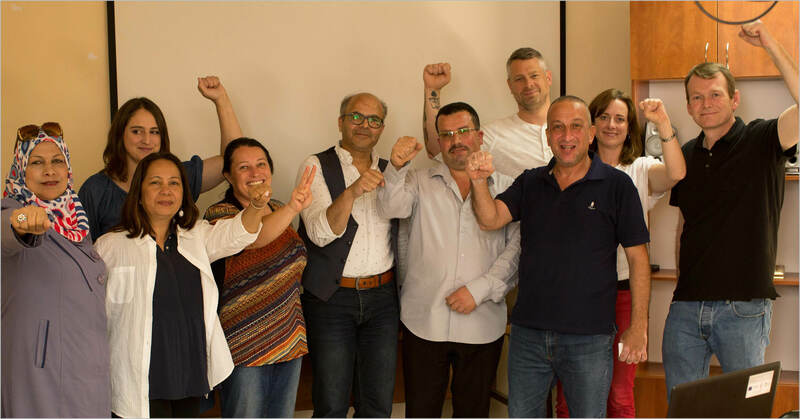 Our delegation is committed to sharing our experiences with CUPE members across the country and will work to increase our understanding of, engagement with, and support of the Palestinian people. Rory Gill is the president of CUPE 709, representing Calgary’s foremen, and is the Alberta Regional Vice-President on CUPE’s National Executive Board.